Ear-caressing term "VIVO" will probably put our readers on to the old all-purpose VideoIn and VideoOut. And the first letter A in the term will be read as Advanced, that is something better. And they will be right in a way. But still, AVIVO is a huge complex of video processing capacities (except for 3D). 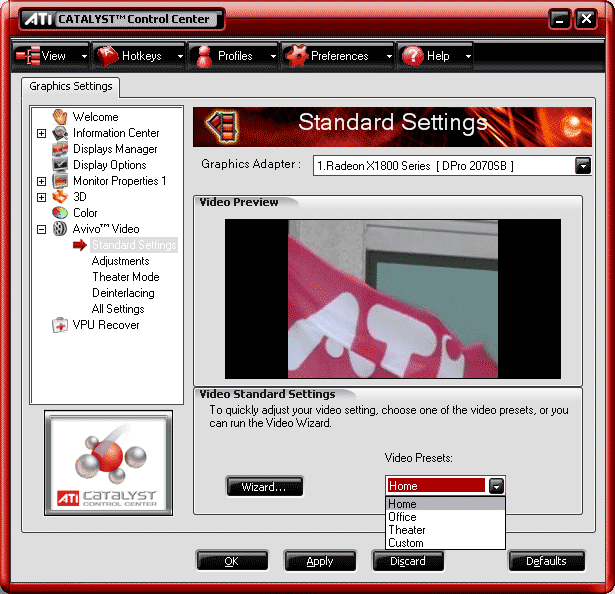 AVIVO is intended to improve the end-to-end pipeline of a video stream until it is displayed. It's a whole complex. In the new products, it will be the responsibility of an advanced ATI Theater 550 processor, which will be installed either on separate boards (to be used together with the main video card) or on All-in-Wonder media centers. It uses 12-bit analog-to-digital converters. This part will be taken by VPU (GPU) itself. Of course, we mean only the new X1000 series, only these processors can encode the following formats on the hardware level: H.264 (new! 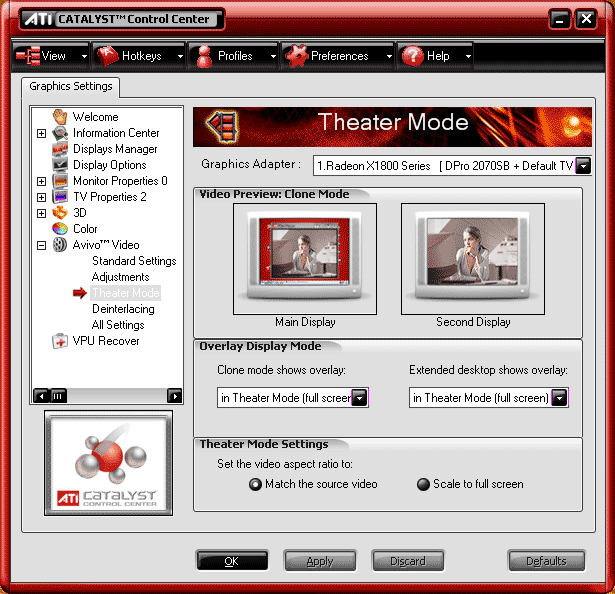 ), VC-1, WMV9, WMV9PMC, MPEG-2, MPEG-4, DivX. Of course, there will be an option to transcode the above listed formats. All of it will be available in the nearest future, after the new drivers are released (plus proper software). The H.264 format is of little use to Russian users so far. But software video encoding in this format takes up terribly much CPU resources. The reverse process works absolutely the same, of course, on the hardware level. Up to now, GPU has taken part only in MPEG-2 decoding. And now all formats will be decoded on the hardware level. The biggest effect from such buck-passing to GPU will be in case of H.264 (not quite relevant for the majority of Russian people). But it's very important for promoting new HD-DVD and Blu-ray technologies, as CPU requirements for their software decoding exceed DVD (MPEG-2) decoding as 8-10 to one. All this will be delegated to GPU! This is evidently done reckoning future prospects! By the way, NVIDIA promises a similar technology a tad later, by the end of the year. Before displaying an image, it should be processed (so-called post processing in 3D). 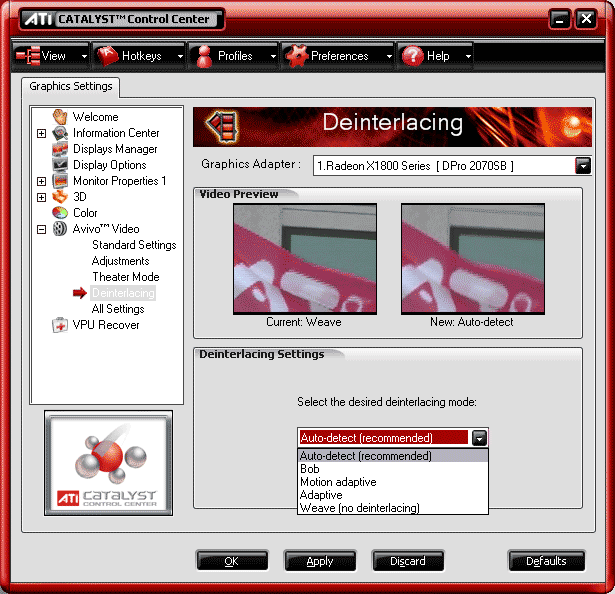 We know that deinterlacing is included into the list of such functions. AVIVO offers a new type of vector deinterlacing. 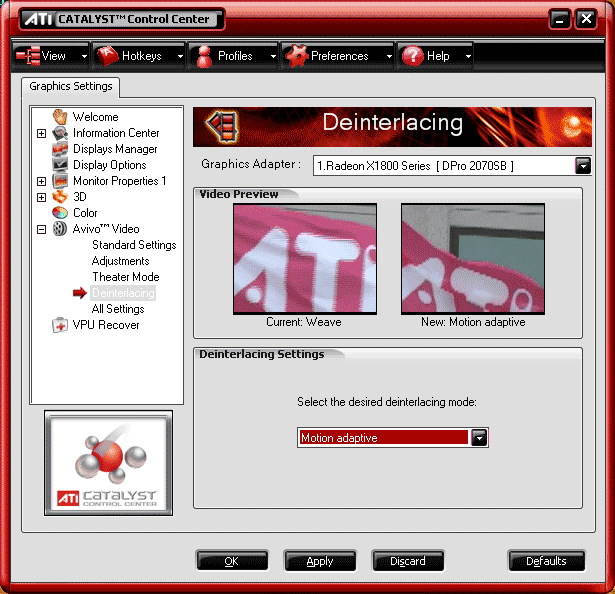 It's an immediate competitor to a similar technology, offered by NVIDIA in PureVideo. In this sector the most noticeable improvements will be enjoyed by owners of huge LCD monitors. The highest resolutions will be available to them via DVI, certainly higher than 1600x1200 (thanks to Dual-Link installed on all new cards). The usual TV-out got a tad improved, there appeared various combinations of adding a TV-set as the second signal receiver. But the best effect will be enjoyed by owners of TV-sets, equipped with ATI Xilleon TV-encoder. Don't forget about the promised 10 bits per each RGB channel (plus 2 bits on alpha - 32 bit in total). That is each of the functions: gamma correction, color correction, scaling, and dithering can be executed with 10-bit fidelity. We got a similar functionality from Matrox long ago, now we get it from ATI as well (as you may remember though, it had been promised in the times of R300, launched right after Matrox Parhelia). Our author Alexei Samsonov has taken upon himself to review AVIVO and PureVideo. So we look forward to his article full of details on pros and cons of each technology, taking into account what and how has been already implemented. On the one hand, the architecture is innovative. On the other hand, it's controversial. There is a feeling of something incomplete — of an intermediate milestone. As if the R520 is not a stand-alone product, but just a stop on the way to the bright WGF 2.0 future represented by the R600, or what you may call it. Not just a stop, but only half of the platform. The second half is Xenos — Xbox 360 graphics chip. Merged together, plus what is just asking to be added, here is the joy. One the one hand, we've got a cool scheduler, which solves the principal problem of efficient shader execution with branching. On the other hand, why aren't shader processors unified? Such architecture would not have needed practically any additional changes, if kept to minimum and not modifying the entire concept. But no, shader processors in xenos are unified already, unlike these products. Or another example - floating point format of the frame buffer — it supports both blending and MSAA. But there is still no filtering for such textures. So almost everything works in FP16 mode, except for the most important — filtering fetched textures. Why implement MSAA in this mode and not bring the concept to an end? Or take vertex processors — there is no vertex texture fetch. It's a pity. It should be noted that pixel shaders with rendering into a vertex buffer are recommended instead. It also solves the problem with no texture filtering. The number of pixel pipelines is smaller than recommended for absolute leadership. The number of texture units in the RV530 is an obvious weak spot, a bottleneck. This list can be expanded with petty issues, but the result is the same — a strong feeling of an intermediate solution. We look forward to the optimized R580, hopefully with more pipelines; we look forward to the R600, which will hopefully not only take the best features from Xenos and R520, but also add everything these accelerators need. As for now, we have a wonderful new "spin", with a new architecture, expectedly "spoiled". The architecture is promising, but not without drawbacks. The drawbacks are not too strong to speak of R5x failure. But the capacities are not that revolutional to speak of its superiority over competitors. ATI has caught up with NVIDIA, having established a promising architectural base. But this base is for the future, for WGF 2.0 and the R600. Should you buy the R520 or you'd better wait for the R580? That's the burning question for ATI fans, as the overhauled solution promises to reveal more of the potential of the new architecture. We'll see! 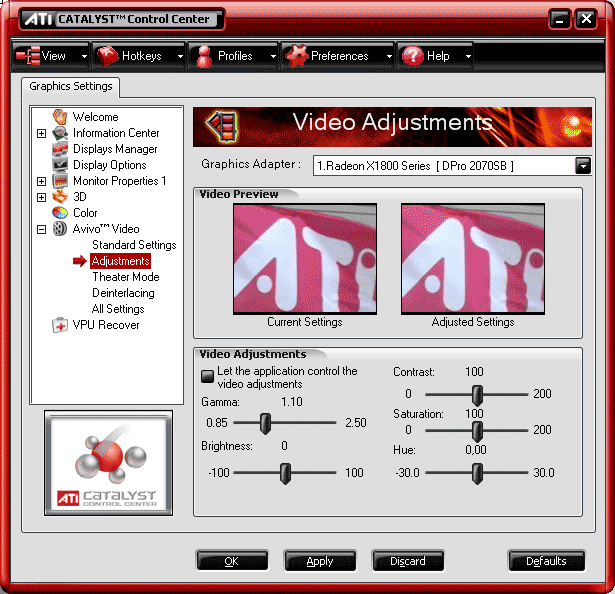 ATI RADEON X1800XT — ATI RADEON X1800XT is cut as a leader. BUT its breakaway from the GeForce 7800GTX is not large. Of course, the technologies, the new cards are based upon, have high potential and excellent prospects. ... But still, 16/8 pipelines even at the transcendent frequency of 625 MHz are obviously insufficient to become an absolute leader and to outperform the 24-pipeline GeForce 7800GTX, even though the latter operates just at 430 MHz. Taking into account the very expensive 1.26ns memory, especially 512 MB, I guess the price of $550 for this card is a narrow escape for the Canadian company. It seems to me that the X1800XT prime cost with such expenses and memory will not be low. Of course, everything will be up to the demand. What will it be like? - We have no answer to this question so far, as the product is planned to hit the shelves on the 5th of November, nobody has such cards so far (even ATI's partners). We should also see the disbursing price to estimate how much money the ever-hungry retailers will charge for such cards (even if the prices are raised unreasonably high). A two-storied cooler a-la X850 has its pros and cons. Con - startup noise. Pro - the heat is driven out of the system unit, of which the 7800GTX cards (except ASUS EN7800GTX TOP) cannot boast. ATI RADEON X1800XL is a complete copy of its elder brother in exterior. The only difference is in its bundle, slower memory, and a cooler. Of course, the core, though the same as in the X1800XT, operates at the much lower frequency of 500 MHz (these cards are evidently equipped with X1800XT rejects). As the X1800 XL differs from its elder brother only by reduced frequencies, this card should possess a good overclocking potential. What concerns the cooler, making it narrow yielded few advantages. Firstly, it's very noisy. As its heatsink is smaller, the core requires a higher rotational speed under load, which obviously does not contribute to noise reduction in modern system units. Secondly, as in case with the 7800GTX, the hot air stays inside the chassis. It takes an expertly built cooling system to draw the heat from the system unit. Of course, these defects have to do with the reference cooler only. Many ATI partners are sure to manufacture the X1800 XL cards with more efficient cooling systems. What concerns 3D performance capacities, RADEON X1800XL will be quite successful, if its real retail price does not exceed $400. Otherwise, it risks losing it to the 7800GT as far as the price/performance ratio is concerned. With all that in mind, can this card possibly be equipped with very expensive 1.4ns memory? — It's hard to say. However, according to the latest news from Japan, where such cards start appearing on the shelves, the initial price is quite moderate and even below the recommended $449. That's good news. 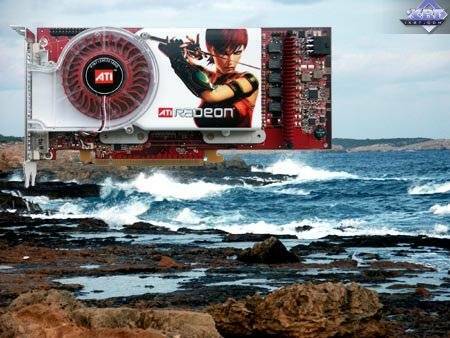 ATI RADEON X1600XT is an interesting and a non-ordinary product. It's difficult to draw final conclusions on it, as they are quite controversial so far. Pricing policy and new drivers may change the situation considerably. The market success will depend on real retail prices for the X1600 XT. If they are kept around $170, the 6600GT will stand no chance of success. However, if the X1600 XT costs about $250, it will have to fight with the cheapening 6800 and the new product to be launched soon by NVIDIA in this price segment. As we have already mentioned above, the RV520 possesses 12 pixel pipelines and only 4 texture units (and ROPs correspondingly). If all games used shaders as a universal solution and texturing were very simple (few textures), the X1600XT would have been unattainable in its class due to its huge shader capacity and 590 MHz core. But! Such games are not yet widely spread (TR:AoD is the first to come to mind). Even though the latest games tend to active shader usage and the X1600XT can obviously be a star in future masterpieces, 4 texture units seem not sufficient. I can assume that the X1600XT initially had more ROPs/TMUs. But hardware mistakes in a die forced designers to disable a number of transistors, resulting in losing some units. Moreover, if you look at the road map, the X1600XT is expected later than the others! Perhaps the Canadian company is trying to introduce additional improvements into this core. A new RV530 revision with more units may be released. ATI RADEON X1300 PRO — ATI RADEON X1300 PRO is a good product with unique functionality for its class. It inherited all architectural features from X1800 and X1600 and became another step towards the future Vista and WGF 2.0. X1300 PRO steadily outperforms the 6600, but its real price must be evidently below $150, in our opinion. Otherwise, it risks being bested by the 6600GT. In my opinion, the relatively expensive 2.5ns memory may prevent the card from dropping in price. However, designers should know better what is easier to do: 4-pipeline chip at 600 MHz or 8-pipeline chip at 300-400 MHz. 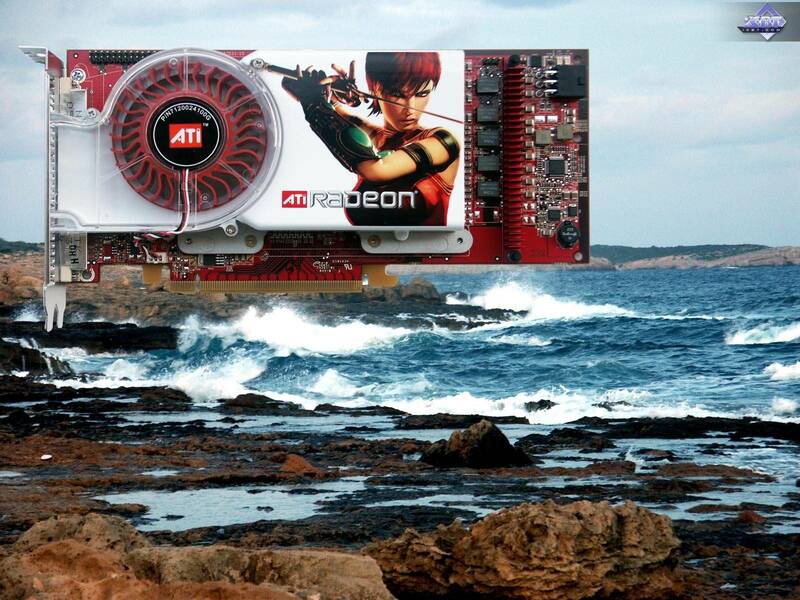 I just want to note that RADEON X700 with its 425 MHz and 8 pipelines is already going down to $100. Besides, X1300 PRO and X1600 XT fully support the promising technological innovations (SM 3.0, AVIVO). Unlike the 6600 and 6800, they work with Adaptive (Transparency, if you like) Antialiasing. So what have we got as a result? The new cards confidently catch up with their competitors from NVIDIA, sometimes even take up the lead, though they still fall behind in some cases. If we ignore performance variations and equate the X1800XT with the 7800GTX, we shouldn't forget about the objective advantages of the entire X1000 series, such as new AA and AF types, AVIVO, DualLink DVI, etc. However, there is a real danger of the X1800XT hitting the shelves significantly higher than $500, there will be a wide price gap from the 7800GTX. The products possess a number of wonderful and necessary features, but they failed to make the so-called break-through, that is to radically outrun the competitor. The reason is simple - they are late. Besides, only few of the new cards have hit the shelves now, the rest will come later. Each delayed day on the eve of Christmas sales brings losses 10 or even 20 times as high as in any other season. I hope the Canadian company is aware of that. The company has already lost 100 million dollars to blunders made by some departments last quarter. I just hope that there will be much fewer mistakes in future. But we should admit that the innovations in the R520 are worthy of respect. First of all, the principally new memory controller scheme, Ultra-Thread technology, etc. The current generation is doomed (sooner or later we shall come to unified shaders), considering Microsoft Vista with DirectX10 to be released in a year, which will need new hardware). It seems why waste efforts now, they still have to produce new products in a year, equipped with principally new 3D technologies. But we should take into account that lots of games are coming out, which use the latest innovations in DX9.0c. Gamers will play them now, not in a year. If you consider video performance in F.E.A.R., for example, you will understand that the speed is not too high in absolute figures in the maximum quality mode (this moral right has been earned by people, who spent $500 for an accelerator). Besides, many gourmets will appreciate improved quality (performance-affordable AA 6x, improved anisotropy). And don't forget about the future R580 from ATI: the new features from the R520 may shine there, even if they are ineffective now. But we shall keep tabs on the new series already among production-line cards. Besides, new drivers for these cards should be released soon. Stay with us and wait for further analysis (there are still many issues to review: ineffective HDR, the lack of overclocking potential, etc. Plus the article on AVIVO from A.Samsonov ).